Reel Talk Online: "The Lady" vs. "The Iron Lady:" Who Gets the Vote? "The Lady" vs. "The Iron Lady:" Who Gets the Vote? While a few good men duke it out to take control at the White House later this year, let's take a look at two films that followed the life of female politicians. On our right we have The Iron Lady (previously reviewed here), the Oscar-winning biopic on U.K. Prime Minister Margaret Thatcher (played by Meryl Streep), and on our left is The Lady, a film on the life of Burmese politician Aung San Suu Kyi (played by Michelle Yeoh, of Crouching Tiger, Hidden Dragon fame). Both films offer an account of women both lauded and defamed in their own countries, and who defied gender stereotypes to become relatively successful leaders. But only one did it successfully--The Lady. Long ago in a land far away, a young girl’s father, a national champion of political freedom, was brutally assassinated by an evil military junta. Though her mother was unable to flee, those loyal to her father spirited the young girl out of her homeland to a new life across the sea. Many years later, upon hearing her mother was gravely ill, the young girl, now a grown woman, married and a mother herself, bravely decides to return to her native country---a country still in the grip of restrictive military rule. How will the despots react to her return? How will the people, who, because of her martyred father, see her as a link to their hope and struggle for liberty, react to her return? How will she balance her love of country and family? Beautiful direction. After the disastrous Mamma Mia!, it's a wonder why director Phyllida Lloyd was allowed back behind a camera again. Her style in The Iron Lady was heavy-handed, deliberate and all over the place. It looked more like an amateur effort. Luc Besson (The Professional), on the other hand, directed The Lady with gentle yet poignant strokes that never seemed forced. Acting that captivates you. We all know Streep can act circles around most everyone in the business, man or woman. But, in the battle of 2011 portrayals of renown officeholders, Yeoh has Streep beat, hands down. Streep seems more like she's imitating Thatcher and doesn't come off as fluid in her performance. Meanwhile, Yeoh embodies Suu Kyi. She immerses herself in her life and you truly feel like she's sympathetic towards her struggle, 15-year house arrest, her every decision--something that is needed to convincingly play a real person. A touching depiction. Aside from the shoddy direction of The Iron Lady, the movie leisurely told Thatcher's story from the point of view of a distant third person, which gave it an apathetic tone. Screenwriter Abi Morgan's (Shame) script came off cold and uninspired, only to be saved by its more affected performances. The Lady offers a heartbreaking chronicle of Suu Kyi's political career amid strife, while also weaving in her relationship with her husband and kids, which humanized her. Screenwriter Rebecca Frayn's full feature debut is alluring, fascinating to watch and, most importantly, makes you care about Suu Kyi. Girl power done right. In a position dominated by men, it's no argument that the real-life heroines, Thatcher and Suu Kyi, proudly overcame gender barriers to reach the levels of success they did, at whatever the cost. But The Iron Lady presented more of a feminism 101 class, an introduction to the inequalities between men and women, and a look at one women who prevailed above it. Lloyd's sweeping displays of how Thatcher was not taken seriously and was treated differently because she was a woman was not a sensitive look at the the issue. The Lady spoke more about Suu Kyi's feminism, without hitting us over the head with it. After all, feminism isn't always about preaching your views to a male audience, but also about leading an extraordinary life as a woman--despite the odds--that inspires other women, the way The Lady presented. In other words, you feel inspired by her story, even if the story wasn't intentionally trying to inspire you. The Lady opens in theaters today. 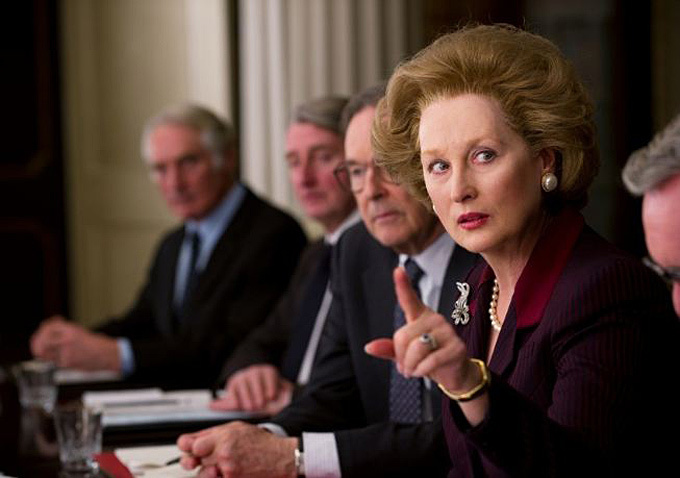 The Iron Lady is now available on DVD and Blu-ray.